Fol­low­ing my Jus­tice League Vol. 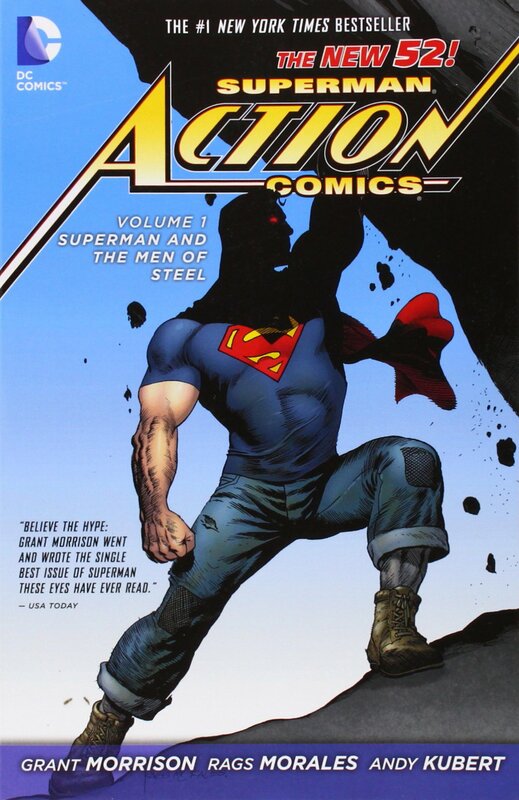 1 write-up, Super­man — Action Comics Vol. 1 is up on the read list. Tech­ni­cal­ly, it takes place before the events of Jus­tice League Vol. 1, but was pub­lished slight­ly after­wards. For Art, I real­ly like Morales’ mus­cu­la­ture, but his faces are so incon­sis­tent. Kubert’s style is great, but it’s eas­ier since it’s all futur­is­tic cos­tumes. As for Sto­ry, usu­al­ly Mor­rison is known for more… high-brow plot­li­nes, but this open­ing arc was very approach­able. I like that, much like Bat­man Year One, Super­man starts with a sim­pler cos­tume and fights human cor­rup­tion. The reviews are pret­ty much unan­i­mous in say­ing this is the most relat­able Super­man in a long time, and I agree. Clark Kent’s jour­nal­ism on behalf of the the down­trod­den ordi­nary cit­i­zens of Metrop­o­lis is a great bal­ance to punch­ing the bad guys when oth­er avenues are exhaust­ed. The inter­galac­tic col­lec­tor bit, while a trope at this point, was a great device for giv­ing Super­man both addi­tion­al infor­ma­tion about his orig­in and some nice tech upgrades. This book intro­duces Glen “Mr. Metrop­o­lis” Glen­mor­gan, Vyn­d­k­tvx, Blake, Zoft, Mar­tinez, Casey, Lex Luthor, Sam Lane, Lois Lane, Inter­gang, Mrs. Nyx­ly, Jim­my Olsen, Angus “Guns” Grundig, Braini­ac, John Hen­ry Irons (Steel), John Cor­ben (Met­al­lo), Emmett Vale, Lana Lor-Van, Zar-La, Zora Lor-Van, Van-Da, Lon-Zo, Jor-El, Lyla Ler­rol, Dal-Vo, Kryp­to, George Tay­lor, Lucy Lane, Jon­than Kent, Martha Kent, Max­im Zarov (Nim­rod), Zod, Xa-Du, Ursa, Non, Jax-Ur, Ras-Krom, Ak-Var, Vak-Ox, Kry­ponite Men, Drekken, Light­ning Man, Cos­mic Man, Sat­urn Wom­an, Natasha Irons, Lana Lang, and Pete Ross. Pan­do­ra makes her one-frame cameo on the run­away train Jim­my and Lana are on. The wrap-up left plen­ty of bread­crumbs for future con­flicts, both as Clark and as Super­man. Next up, Green Arrow Vol. 1.